Here I will explain how to get data between two characters range in SQL server or get user details start with A-C range in SQL server. In previous articles I explained Acid Properties in SQL Server, Query to get database size in SQL Server, show time difference in minute ago hour ago etc in SQL Server, can function return multiple values in SQL Server and many articles relating to SQL server. 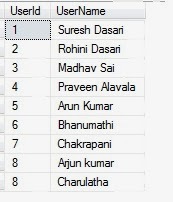 Now I will explain how to get data between two characters range in SQL server. Did some more combinations and found that the where clause LIKE '[A%M]%' will return the searched column ONLY if it has values starting with "A" or "M"